The first press day at the North American International Auto Show (NAIAS) in Detroit, Mich., was packed with news from automakers. Included in the flurry of announcements was a juicy projection from Toyota. The manufacturer plans to expand the Prius…into an entire brand. What we know as “a” Prius will become a whole line of them. Think of it as the hybrid-version of Scion but with a truck, a station wagon, and a CUV thrown in the mix. Sounds pretty gutsy, right? But growing “a” Prius into multiple cars results in a grammar conundrum. If you know me (or if you’ve ever read my Twitter bio), then you know that I’m a fan of correct grammar. (I can sense that this post will be carefully proof-read after having made that statement.) Four years of Latin in high school make this challenge particularly tricky for me because I know what the correct ending should be. Toyota has launched a campaign via clever Schoolhouse Rock inspired video that asks people to help the car maker determine the plural for “Prius.” While I know which ending my Latin teacher would want me to select, I’m leaning in another direction. Here’s the deal. We have exactly one month from today to help Toyota solve the plural Prius puzzle. 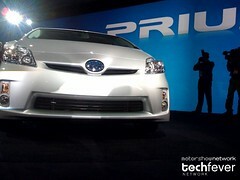 Toyota will announce the official name of the Prius line on February 20 at the Chicago Auto Show. I’ll be tracking the campaign here on Be Car Chic blog and @BeCarChic, so subscribe for email updates here and follow me on Twitter to receive the latest news. Take a look at the video below and then vote for your favorite manifold term for the future Prius line on Toyota’s website. Will you choose Prii, Priem, Priuses, or just plain ole Prius? Let me know which way you voted in the comments! [youtube=http://www.youtube.com/watch?v=nUor4gdFoyg]Learn more about the Prius grammar conundrum on their website and Facebook page. Great article! I think there are a number of angles that they could take. The route they took with Scion is to just add some letters to the brand and make a model…Scion xB, xA, TC, et all.They very well could do the same with the Prius. This would mean that all of the marketing dollars spent up until now will not go to waste because they have to market a new name.As a series, Prii is probably the grammatically correct, but it would probably be more often read as Pre… (and the conjure up more images of Palm Pre than Toyota Prius).I think Prium or Priem is a better sounding name, it is not too far off from the name that has been marketed since 1998, to me it seems the more natural progression, as I would tend to think of multiple Priuses as Prium or Priusi (also a bad one). nice article… A whole range of Prius sounds pretty good. As far as the name for the line goes, the plural form of Toyota Prius as “Prii” sits pretty well. On second thoughts maybe a “Priiz” also sounds nice. Definitely not Priuses or Priusi.Toyota is a great example of a well managed and organised company. Specially after the invention of hybrid cars.